Multiple myeloma is a rare hematological malignancy affecting less than 5 per 10.000 people in the European Union. In clinical practice, there are a range of novel and chemotherapeutic treatment options available for patients. However, despite recent improvements in overall survival, myeloma remains a largely incurable disease. Our mission is to trial the emerging CAR-T cell technology in a cohort of European myeloma patients to understand whether we can overcome existing treatment limitations and find a more curative approach. A clinical proof-of-concept for CAR-T cells has already been obtained in other hematological malignancies, e.g. B cell leukemia and lymphoma, resulting in dramatic and durable anti-tumour responses in patients. CARAMBA will be the first clinical trial to target the myeloma-specific protein SLAMF7. The project has a mission to better understand the role of CAR-T therapy in myeloma and to explore regulatory and sustainable funding approaches for health care systems to ensure patients can access this type of innovation. Chimeric antigen receptors (CARs) are synthetic designer molecules that are capable of redirecting the specificity of T cells to potently eliminate tumour cells. We have now developed a novel and unique CAR approach targeting the SLAMF7 antigen in myeloma and already obtained proof-of-efficacy in comprehensive preclinical testing. The novel SLAMF7 CAR design allows to select, detect, expand and delete CAR-T cells. Its proprietary SLAMF7-targeting domain is humanized to prevent immunogenicity and premature rejection of CAR-T cells. It is of particular importance, that SLAMF7 CARs are equipped with an EGFRt safety switch that can be triggered with anti-EGFR antibodies to deplete CAR-T cells in case of toxicity or after a therapeutic window once tumour clearance has been obtained. A major achievement in the CAR-T design has been accomplished through our expertise in “Sleeping Beauty” transposition (i.e. the delivery of the CAR engineered gene into the human cells). In CAR-T this is typically done using viral systems or “vectors” which are efficient but may pose risks to the patient. Our approach guarantees a viral-free, high-level CAR gene transfer into safe genomic loci and is a major milestone for the development of a myeloma CAR therapy. The manufacturing process for CAR-T cells using our novel Sleeping Beauty-based gene-transfer approach has already been established under good manufacturing practice (GMP) conditions ensuring a rapid and high-quality production process. The clinical trial within CARAMBA is designed as a Phase I/II trial. Phase I is a dose escalation study and will explore the effective dose of the CAR-T cell product. For the Phase II part of the trial, 25 patients will be treated with the maximum tolerated dose of SLAMF7 CAR-T. After CAR-T cell infusion, all patients will be observed as inpatients (in hospital) for at least one week and then periodically as outpatients (at home). 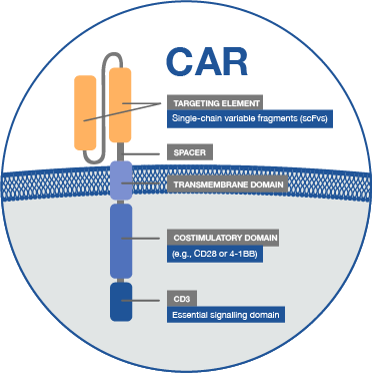 “CAR” gene sequences are inserted into the DNA of the T cells to create the “CAR-T cells”. This engineers them to be able to find and target the SLAMF7 protein on myeloma cells. Subsequently, T cells are infused back into the patients, where they can multiply when they encounter the targeted proteins and kill the targeted cancer cell. CARAMBA aims to deliver a new therapeutic option for patients with myeloma and shape the next generation of medicine in rare diseases. CAR-T cell therapy is a novel, radically innovative therapeutic strategy with the attraction that a single infusion of CAR-T cells potentially offers curative anti-tumour efficacy and protection from relapse given their capacity to form long-lasting memory cells. From clinical trials with CD19 CAR-T cells in leukemia and lymphoma in the US, there is growing evidence of the impressive efficacy of CAR-T cell immunotherapy, even in patients where conventional treatments have failed or are no longer effective. The experience with CD19 CARs has shown that the onset of the therapeutic effect is rapid, durable, and begins immediately after infusion of the CAR-T cell product. Thus, cancer patients and physicians alike are eagerly awaiting the clinical introduction of this therapeutic modality in the EU, especially in rare cancers. We anticipate that where anti-myeloma efficacy of the SLAMF7-CAR is demonstrated in our trial, the wider work of the CARAMBA project will assist further exploration and its rapid implementation into clinical practice. Knowing that SLAMF7 is also expressed in other rare hematologic diseases, once proof-of-concept has been obtained, SLAMF7 CAR-T cells could also be used for these indications. In addition, CARAMBA has already identified additional target antigens, that would allow to gear not only additional tumour indications but also other conditions, including autoimmune diseases, transplant rejection and degenerative diseases, ultimately aiming at establishing immunotherapy with engineered CAR-T cells as a broadly applicable therapeutic concept for rare diseases. CARAMBA is a EU-funded project that has started on 1st January 2018 with a project period of 52 months. Within its first 18 months, the GMP manufacturing process of the CAR-T product as well as the clinical trial approval will be finalized. We are confident that the first phase I patients will be recruited in summer 2019 and patients for phase II will be screened from summer 2020 onwards. CARAMBA is highly committed to an open data policy and will present its generated data after completion of phase I (beginning of 2020) and II (summer 2022) at national and international meetings to physicians and the patients’ community. research and innovation programme under grant agreement No 754658.